That’s the official school motto of Marjory Stoneman Douglas (MSD) High School, where Jacksonville University (JU) alumnus Gabe Stewart (‘16) coached. 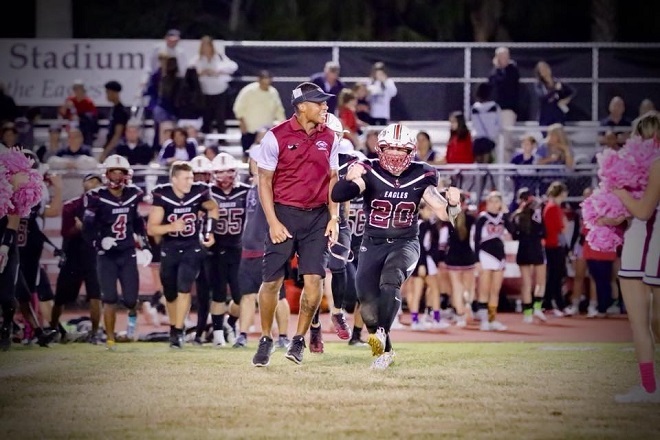 But the mantra 23-year old Stewart carried —literally stamped across his chest— into one of America’s most iconic tests of survival and athleticism was #MSDStrong. 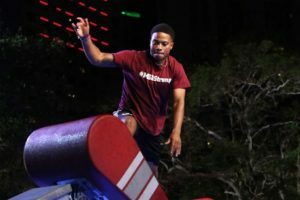 On June 13, he appeared in the tenth season of “American Ninja Warrior.” Only one of many experiences he will never forget. Staying with friends, moving from place to place, with no home to call his own, he says that football, basketball, and track were what kept him “on track” and in school during those difficult years. By his sophomore year, Stewart was playing varsity football, what he considered a real turning point. “I fell in love with football. 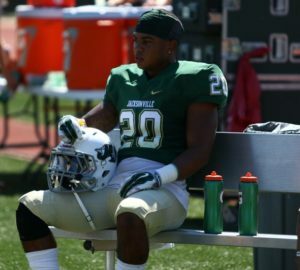 In 2009, we made it to the Maryland 4A State Championship and played in the Baltimore Raven Stadium.” He’s a diehard Ravens fan and lists the experience among his fondest memories during a time when he rarely knew where he would sleep or find his next meal. As a junior, and still without a permanent residence, Stewart made a connection with a family who offered him a place to finally call home. “The Morehead-Yost family are the kindest people I have ever known,” he says. By senior year, his excellence on the field landed him a place on the Maryland All-State Team and an opportunity to practice at the University of Maryland and benefit from collegiate-level coaching. Through a series of re-connections and introductions, Stewart entered Shepherd University as a preferred walk-on. Though his freshman year led to making travel squad, he made the hard decision to relocate to Florida with his adoptive family. 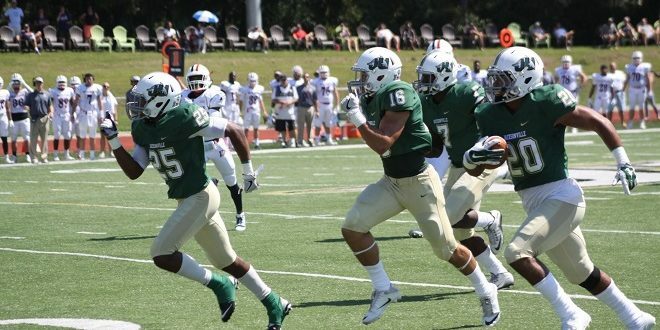 “It was always my dream to be a D1 athlete, and I can’t imagine a better experience than the one I had with JU’s football program,” Stewart says. Though a stranger—new to the city, the state, and the University—Stewart says JU embraced him. “My high school was hundreds of miles away, nobody knew me, and still they accepted me. I found lifelong mentors in the coaches at JU, friendships in my teammates, and some amazing professors. Stewart graduated in December 2016 with a Bachelor of Science in Social Science and a minor in Coaching. His first position at West Jacksonville Middle School was followed by his acceptance of a position at MSD. There he taught world history and coached junior varsity basketball, track and field, and football. On February 14, 2018, Stewart reported to the MSD campus just like every other day. “It was a normal day. I had three periods of teaching, and the fourth was planning,” he says. School staff had been notified that a “code red” active shooter drill would take place in the coming weeks, but no one knew exactly when. As the school day progressed, a fire drill sounded and everyone went through the motions. After eating lunch and prepping a track and field schedule, Stewart visited a neighboring classroom, checking on one of his student athletes. Fifteen minutes later the fire alarm sounded again. While students proceeded to fire drill stations, again, teachers wondered if it was actually the active-shooter drill. Then the first gunshot rang out. Pressing students back into the classroom and directing others to return to a room and clear the hall, Stewart combed the surrounding area. Teachers had initiated code red protocol, doors were locked, and a group of about 20 students was left stranded in the open. Once that group had safely joined the others, Stewart returned to that neighboring classroom. He waited nearly three hours with his students until SWAT teams cleared the campus. NBC reality show “American Ninja Warrior” (ANW) has roughly six million viewers each season. Three-time Primetime Emmy Award nominee, the show frequently inspires spin-offs and specially themed competitions. Sometime before the qualifiers last spring, ANW contacted MSD about hosting a tribute episode. When representatives of the show asked school administrators who on staff could handle the daunting 10-part obstacle course, Stewart’s name quickly came up. With only three weeks to train, and competing against 100 other contestants, he raced for the opportunity to appear on national television and reach for the coveted $1 million prize. Though for Stewart, the ultimate prize had nothing to do with dollar signs. “I want to see my students smile again, give them something to be happy about and look forward to,” he repeatedly told reporters, and smiles were everywhere at viewing parties hosted by MSD on June 13. “If they give me a call in future, I would love to return,” Stewart said of his Warrior experience. Most recently, Stewart accepted a teaching and coaching position at Thomas Stone High School in Maryland, back in his hometown. His advice to current JU students, or anyone considering teaching as a career: love kids, first and foremost. Stewart says that you can be as educated and well-informed as you like, but without a passion for putting kids first, none of that will matter. He feels the need for role models, coaches, and teachers in Southern Maryland. Perhaps more deeply than most, given his humble start. But he holds out hope for happier days, both at Stone and in Parkland, where he will visit soon and often. “I will never forget MSD and will always have the Eagles in my heart,” Stewart says.